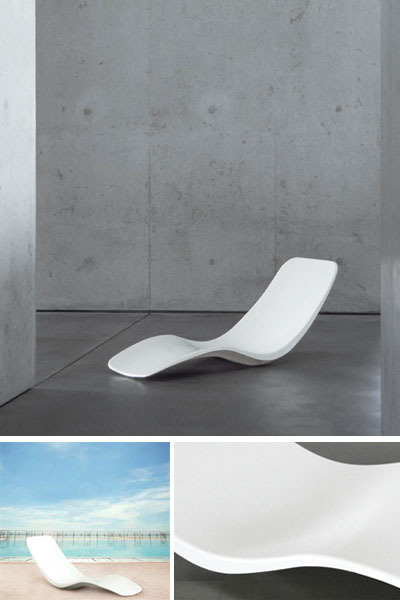 This is an amazing sculptural outdoor lounge chair. The beautiful organic shape of the sun lounger recalls the Space Age forms of the 1970's and movie sets like Stanley Kubrick's "2001"! The sun lounger is also used on the roof top deck swimming pool of the Standard Hotel in Los Angeles. Made out of strong fiberglass with satin finish. The color is a pure snow white (one of the advantage of fiberglass is that it never yellows)!!! Perfect for contract jobs, exclusive hotels, near swimming pools or on your private Yacht.